IPv6 has been right around the corner for a long time (13 years by my count). I have just started embracing IPv6 for the home environment this year. I bought a buffalo router running DD-WRT to replace the Linksys system we had been using for our home firewall/router. You can shell into the underlying embedded linux system and configure things directly. I was able to configure a 6to4 tunnel on the router and get our home environment operational with IPv6. I was motivated to do this to complete some testing for a client. The downside is that ip6tables does not come with the version of DD-WRT I'm using. You need to build the kernel module. I got about half way through that and got distracted by other things, so I turned off our tunnel. Perhaps I can get that set up over Thanksgiving break. Former Cisco colleagues Darrin Miller and Sean Convery wrote up a very excellent threat analysis of IPv6 a few years back which you can find at Sean's IPv6 page. Darrin was gracious enough to come and visit my class several years back, and he gave a very excellent presentation of the issues. One of the big IPv6 issues he identify was the tunnel transition issues. Even if my home router had IPv6 installed, my windows 7 system seems to have installed a 6to4 tunnel for me. If the traffic is tunneled going past the border firewall there is no way it can make even the most basic checks that most home routers do to prevent or limit connections initiating from the outside. Seems like that threat is coming true as predicted. As I noted in my earlier blog, I've been working on a project that involves intercepting network packets on a bridged/routed linux box transparently. I'm intercepting more packets than I really need, and processing the first few bytes of the session to determine if the packet is part of a protocol I care about. If I determine this isn't the target protocol, the program mindlessly forwards on the rest of the packets in the session. This strategy seemed to work reasonably well. The program has been in various states of test for about a year and seemed to mostly work as advertised. Finally got paired with a more dedicated engineer from the customer company to finish up the testing, and we deployed in the office environment. Slingbox from the office stopped working. Read up on the slingbox protocol, took packet captures from both interfaces, and stared at them. Finally, I noticed that the first packet of the TCP session on the incoming interface was N bytes, but two packets of size O and P (such that O + P = N) appeared on the outgoing interface. My program passing along the the for O bytes before deciding it wasn't the write protocol and passing along the rest of the packet. The slingbox program "should" have been smart enough to keep ready if it didn't get enough bytes on the first read, but evidently this particular slingbox implementation didn't. So as the intermediary program, my program adapted and buffered its write, and then all was well with slingbox. I noticed a few days later that I was getting fewer computers communicating along the desired protocol with my program in the middle than when my program was out of the picture. Saw that I was splitting the first packet for the protocol match case too. Evidently some implementations of the target protocol also don't continue reading on the TCP socket. I fixed it to buffer the first packet in all cases, and the difference in the number of communicators went away. Two lessons I learned. 1. Never make assumptions about how the network communication "should" be implemented. 2. A dedicated engineering driving testing can uncover a lot of interesting issues. There can never be enough pictures of chickens on the Internet. 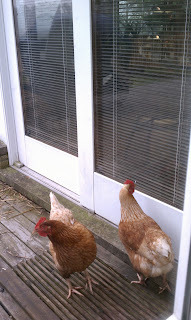 Two girls from our original flock of five last summer waiting to get in. So far only one has made it in. She got really confused and stayed on the door mat squawking until I shooed her out. 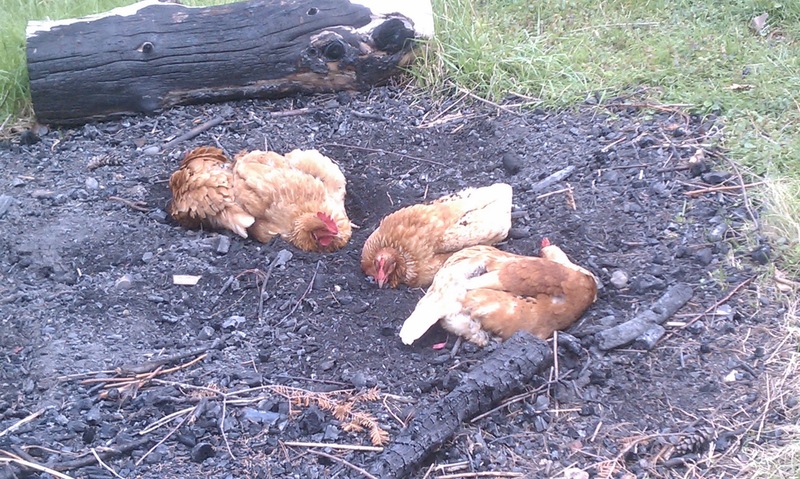 At the beginning of this summer, we had the unfortunate chicken massacre. 4 of our 5 chickens were eaten by some unseen predator. Based on how the predator had to access the chickens, we suspect a raccoon. 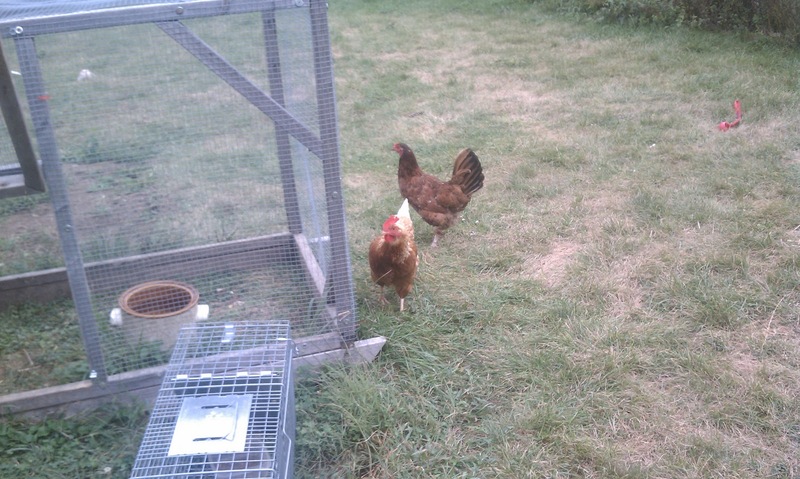 We reinforced the coop and waited until the end of the summer to get two new hens from friends. 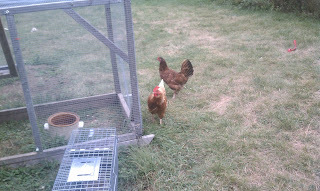 Below is Brownie and one of the originals, Chooksie. 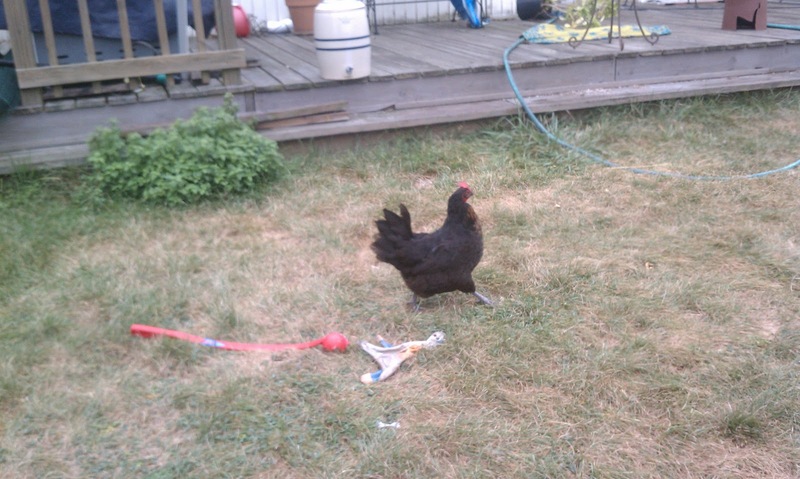 The other new chicken is below, Blackie.